Stamping can be a lot of fun, but if you're on a budget it's hard to be creative if you only have a few stamps to work with. There's nothing more frustrating than wanting to have a hobby and be unable to afford it. With just a few materials, some purchased, some recycled and "green," some that you'd normally have around the house and a bit of ingenuity, you'll have just the formula for some good creative fun. For example, if you have some old puzzle pieces, an empty pill bottle container, some markers, craft glue, some ink pads, some odd assorted collage materials, and a handful of wiggle eyes you can make some very unique stamps to use on cards. The puzzle piece chick and frog stamps in this book are simply adorable! Children love crafts, especially ones that offer a high level of success and look good. 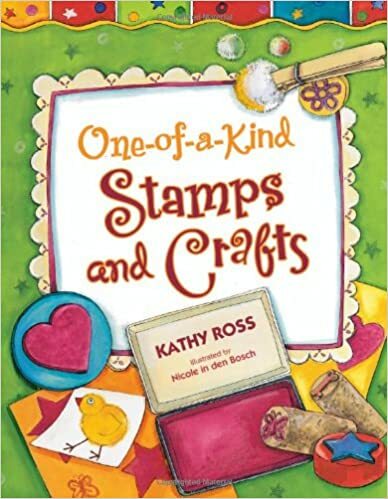 Keep in mind that because of the many small items used in these stamping projects, if you decide to purchase this book for children under the age of nine, you will need to supervise. Each of these projects has a visual list of items the crafter will need. Most of these items can be readily found around the house or gathered from other sources. I did recognize many that can be purchased in a local dollar store. Once the materials are gathered together, there are step-by-step instructions, written and visual. I loved the ingenuity in this book and the set up is a perfect for the youngster who can work independently. Quill says: This book would be a welcome addition to any homeschool, classroom or library shelf!